How to celebrate the Fourth of July in D.C.
Fireworks light up the sky near the Lincoln Memorial on the Fourth of July. There’s no better place to celebrate America than the nation’s capital. If you are looking for a classic Fourth of July experience – the District does not disappoint. The National Independence Day Parade will run down Constitution Avenue between Seventh and 17th streets starting at 11:45 a.m. The lineup features marching bands, choirs and dance troupes. Later that night, relax on the West Lawn of the Capitol Building for the annual Capitol Fourth concert. Hosted by actor John Stamos, the celebration’s lineup includes acts like the Beach Boys, Pentatonix and Andy Grammer, alongside the National Symphony Orchestra. The concert begins at 8 p.m., but general admission starts at 3 p.m. to give you a chance to beat the crowds. 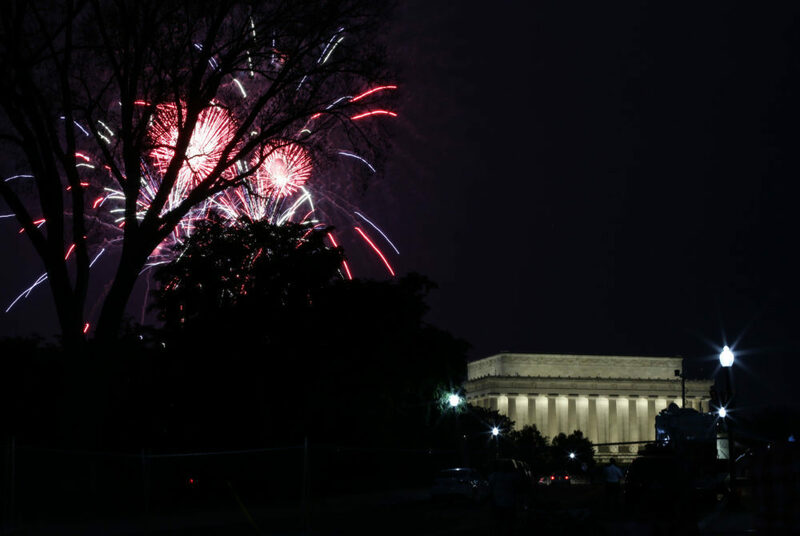 At any spot on the National Mall, you’ll have a great view of D.C.’s huge fireworks show, which begins at about 9 p.m. The Wharf’s Fourth of July celebration will feature a slip-and-slide, face painting and games for all ages. After starting your day on a family-friendly note, you can grab drinks at the Waterfront Beer and Wine Garden from 1 to 4 p.m. or head over to La Vie, The Wharf’s newest luxury rooftop bar, for a few drinks. At the bar, located at 88 District Square SW, you can get sloshed with Mezcal Mule Slushes ($7) and a free tequila tasting from Mezcal El Silencio while taking in views of fireworks. If you’d rather be at sea level for the fireworks, round up the group and try a boat tour courtesy of Potomac River Company. If you shell out the $125 for a ticket, you’ll cruise around on a boat outfitted with beer, wine and snacks available to purchase. Rooftops around D.C. are raising a glass – and their prices – for Fourth of July celebrations Wednesday. Events at the W Hotel and the Watergate Hotel can go for a steep $250. While prices can seem high, some are worth the price tag for a prime party location – but not all parties are created equally. Start the night early at Jack Rose Dining Saloon’s rooftop terrace, which will open at 3 p.m. for its “AmeriCAN DrinkDependence Day.” The party has an affordable price, as you can dine on half-off mini plates and down $4 cans and $5 draft beers. Located at 2007 18th St. NW, the restaurant offers views of the fireworks from its open-air terrace, or stay in the balcony room to avoid an in-your-face fireworks show. Another party with a view will take place at Crimson View atop the Pod Hotel. The bar in the boutique hotel, located at 627 H St. NW, will start at 1 p.m. and continue on through the fireworks show. Score a $20 ticket at the bar, and it will open up an all-you-can-eat lunch of American classics like fried chicken and barbecue food all washed down with Jim Beam cocktails. If you want to avoid crowds, visit celebrations that are off the beaten path. The Palisades Picnic and Parade begins at 11 a.m. at Whitehall Parkway, just down the road from the Mount Vernon Campus. Stand and watch the parade go down MacArthur Boulevard or join the community parade yourself. The parade ends at the Palisades Recreation Center at 5200 Sherier Place NW, where you can grab a slice of watermelon and other summer snacks at a free picnic. If you want to get out of the District, head to a house party – at the first president’s estate. The Mount Vernon Estate has fireworks shows at 1 and 9:30 p.m. Wednesday. Start the morning early with historical reenactments and a tour of the estate from 8 a.m. to 5 p.m. Or arrive later and enjoy a night of games, barbecue food and birthday cake in honor of the country’s birthday starting at 6 p.m.